Mid sentence Jim exhaled an audible groan and instantly we burst into uncontrolled laughter. The groan just reflected the thoughts echoing in our heads as we bounced, banged and rocked our way along the red clay road in a remote rural area of Cambodia. Our hosts were taking us, no, bouncing us to a village where BioSand Filters where in production. 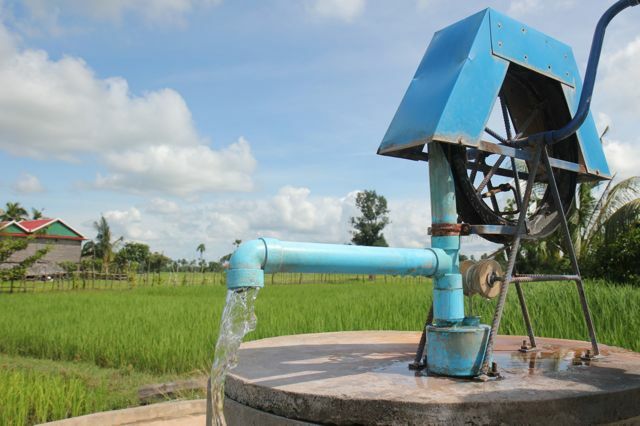 We had come to Cambodia to see the good.water wells that Good Trust had funded and our partners Samaritans Purse have installed. Once at the communities we saw the wells, turned the handles to pump water, took photos and asked questions. It was incredibly satisfying to see clean water pouring from a hand pump on a well that we had enabled. Yet after watching them pump water, they promptly poured it into these bizarre looking concrete containers that trickled forth clean drinking water. To be honest, before seeing Bio-Sand Filters (BSFs) in action I had not appreciated the importance they played in providing clean water. I very naively thought that we put a Well in, and the water was fresh and ready to drink. It is close, and infinitely better than drinking brown dirty water directly from the rice fields, which is what they did before, however when the water is filtered through a BSF is is 99% free of the germs and ugly stuff that causes sickness. Once we arrived at the village where BSFs were being built, we saw how actively involved the community was in constructing them. SP provided the molds and materials, and the people set about building almost a 100 BSFs for each home in the area. BSFs are very low maintenance and last up to 15 years. (If you want to know more about how BSFs work click here). And the cost of the materials to provide clean water to a household for 15 years? Personally what struck me most as I left the communities we visited was not that they had clean water, but rather how incredibly fortunate we are. To get clean water they hand-pump water, carry it back to their home and pour it through a BSF. I on the other hand not only shower in drinking water at the turn of a tap, but water my lawns with drinking water in the summer. And, for the price of feeding my family of 5 takeaways on the odd occasion, I could provide a family with clean water for 15 years! Lesson 2 from Cambodia visit 2012: Bio Sand Filters are awesome value and worth the investment.